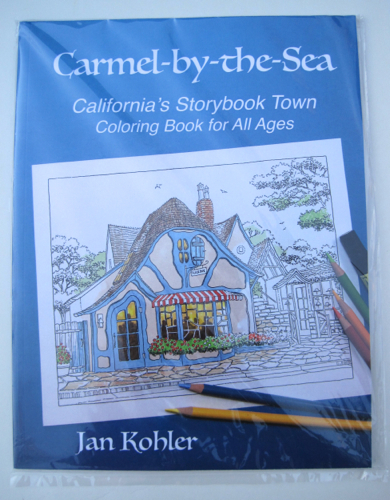 New giveaway: Jan Kohler's Carmel-by-the-Sea coloring book! 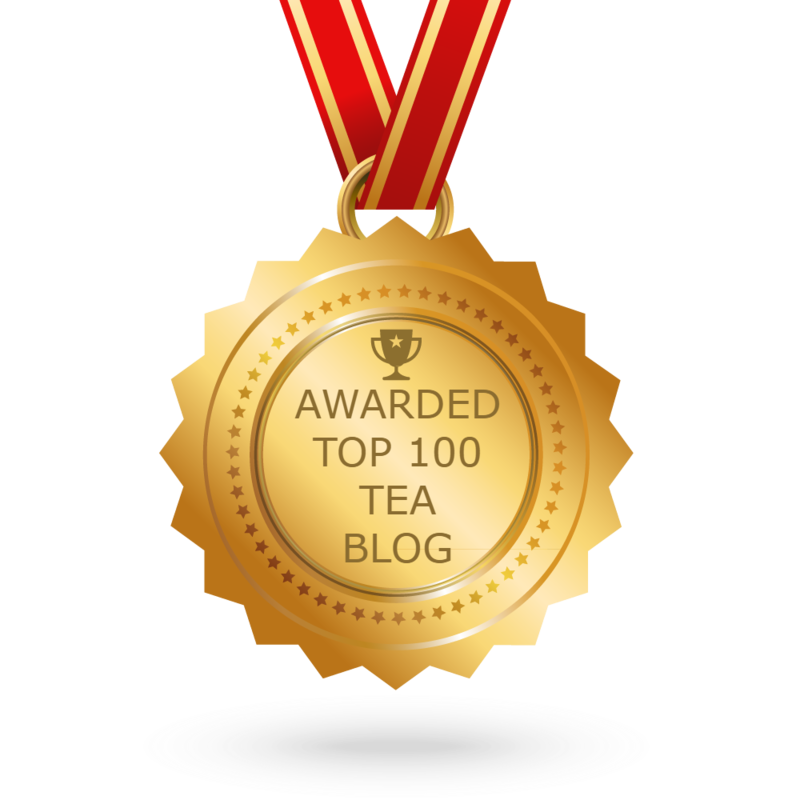 One of the unexpected pleasures of blogging in tea land has been the discovery of so many talented and creative individuals who happen to share my love for tea. Even though I haven't (yet!) 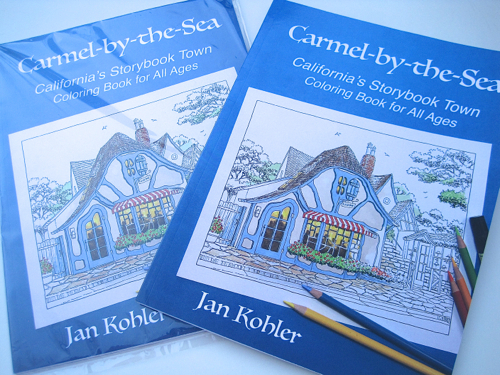 met Donna Kohler in person, we've corresponded over the years about some of our various creative projects and teatime, so I was delighted when she wrote to let me know her husband Jan (he was born and raised in the Netherlands, so it's pronounced "Yan") has just published a coloring book about Carmel-by-the-Sea in California. Donna said she wanted to send me one and also offered one for me to give away to one of you, so of course I was only too happy to accept her generous offer! 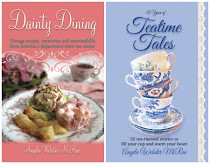 On the cover is an image of the famous Tuck Box, built by Hugh Comstock in 1926 and operated as a tearoom in the forties by two sisters from England. It's still in operation today, and you can click here for more information. I've never visited the Tuck Box, or Carmel-by-the-Sea, for the matter, but oh, how I want to after reading this delightful book filled with images of charming cottages and businesses! Have any of you been to Carmel-by-the-Sea? I'm betting some of you have, especially those of you who are frequent travelers and/or live on the west coast (or are dog lovers; apparently the town is known for being quite dog friendly!). The Tuck Box is so reminiscent of Merrie Olde England with that cheerful awning and those pretty flowers blooming in the boxes out front. One thing I noticed was that somehow, Kohler has managed to create drawings that could be colored in minute detail by more advanced colorists, yet they aren't intimidating at all to amateur colorists such as myself. I love that! This page, of course, was the first one I colored, and the book also features drawings of other buildings like the Prestige Hat Shop, Cottage of Sweets, and even the Cypress Inn, co-owned by actress Doris Day, and Hog's Breath Inn, once owned by actor Clint Eastwood. 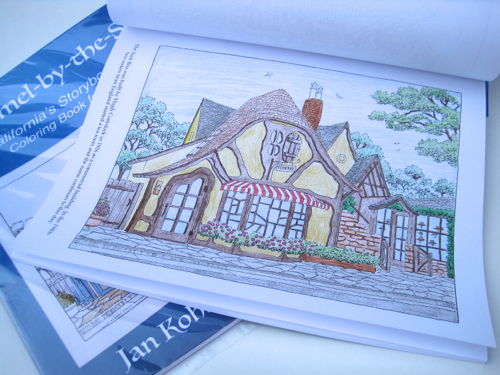 So go ahead, make my day and leave an "Enter me" to this post if you'd like to win the giveaway copy of Jan Kohler's terrific new coloring book! Entries will be accepted from now until 7 a.m. EST Friday, March 3. (US and Canada only, please.) Donna shared with me a great article that was written about the new book, and I loved that it included a link to a video showing how Jan created the coloring book. Go here to check it out for yourself. And if you'd like to go ahead and order a copy of the book now on Amazon, click here. Boy, has spring fever struck! These temperatures in the seventies have been delightful, and after I finished a three-week book edit and celebrated on my afternoon walk yesterday, I took in the cheerful sunlight, the daffodils, the budding Bradford pear tree in my front yard ... and reminded myself that the temperature is supposed to dip back down over the weekend. 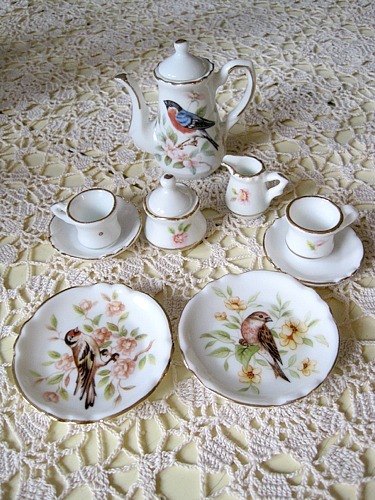 Still, the chirping birds and I were all pretty happy with the weather, and those birds very much reminded me of the last item from my recent motherlode of gifted teawares, this miniature tea set. 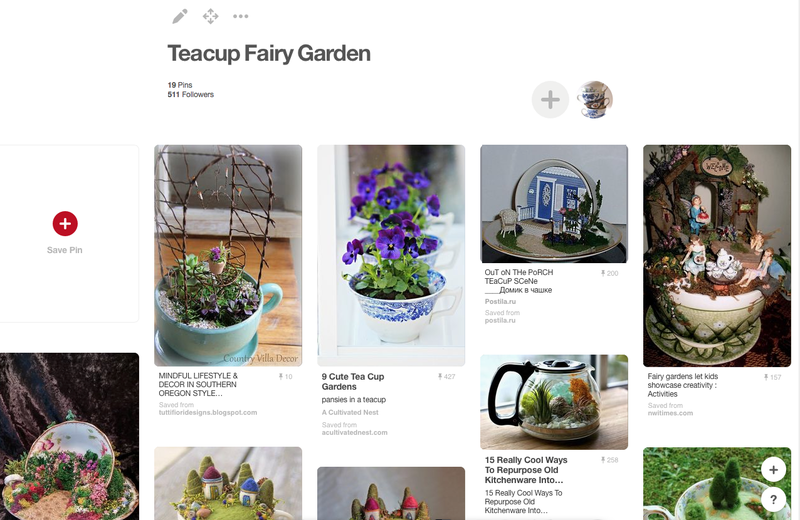 I'm thinking this belongs in a fairy garden, don't you? 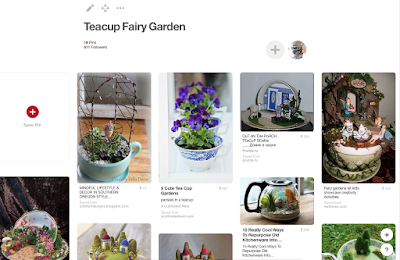 If you're interested in the idea of teacup fairy gardens, I have a whole folder of them on Pinterest, which you can find here. 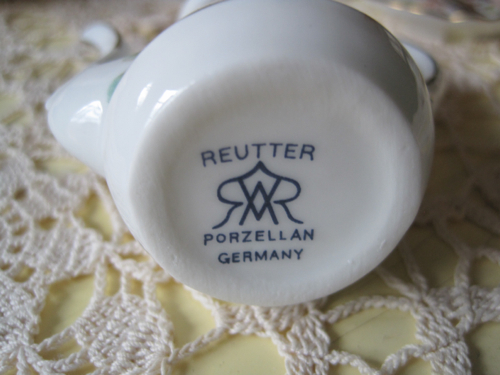 This mini tea set, by the way, is marked Reutter, a firm I'd not heard of but that I found out is a German company whose wares are now available here in North America as well. Whether spring has officially arrived here in Newnan or not, it's definitely arrived in my soul! 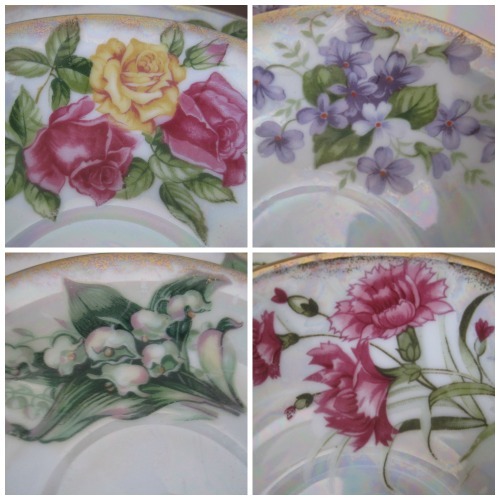 For more than 20 years now, I've been using the Johnson Brothers Rose Chintz dishes that my late grandmother gave me, and I still absolutely love this pattern. So I was especially delighted to see it get the spotlight in the new issue of Tea Time magazine in a feature called "Coming Up Roses." I really enjoy how they will show a pattern and mix it up in some unusual new ways, including formal and casual settings. 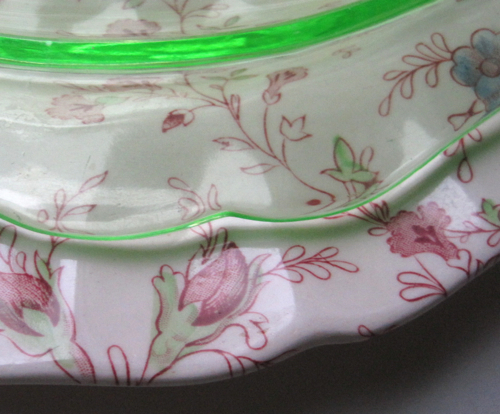 I wouldn't have thought of pairing my JBRC with Jadeite as they did, and I don't own any Jadeite, but their idea did prompt me to check out how a green glass plate might pair with this pattern. Interesting! 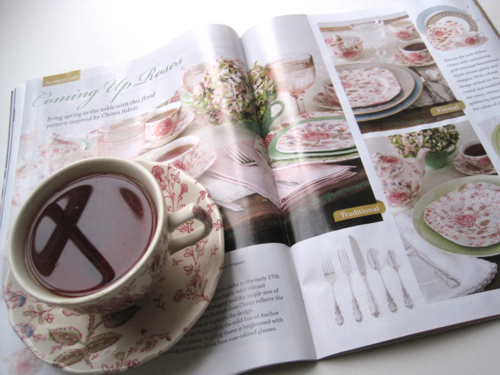 The cover photo this time is from a feature on a tea with vintage china, an idea I wholeheartedly endorse! 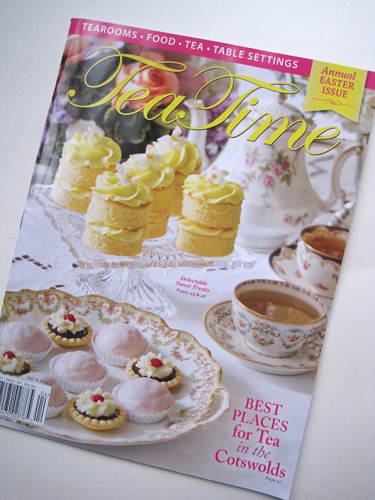 This issue is hitting me at just the right time, as I'm currently planning a tea for 25 or so local widows near the first of March — and I really want it to be lovely. Some friends in my Sunday School class are assisting as well, and I can't wait to see how this tea all comes together! Two weeks ago, I mentioned that I had received a teacup bonanza from not only a longtime friend but also from a friend of hers I'd never met before that day, someone who (to my amazement) also wanted to pass along some teawares. 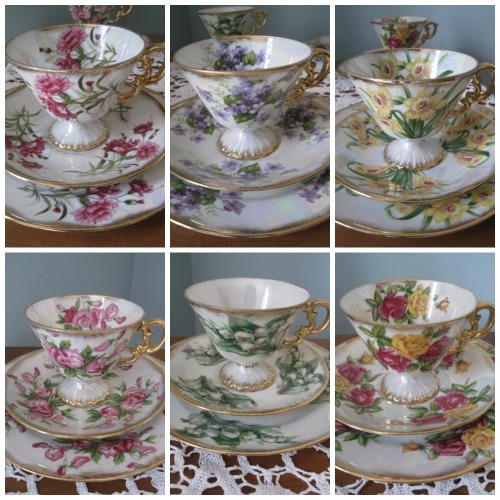 I so enjoyed the lovely afternoon I spent with these friends old and new, and after showing you the first batch of new teacups, I realized it was time to share the second batch of new teacups I received. Aren't they lovely? And all in mint condition! 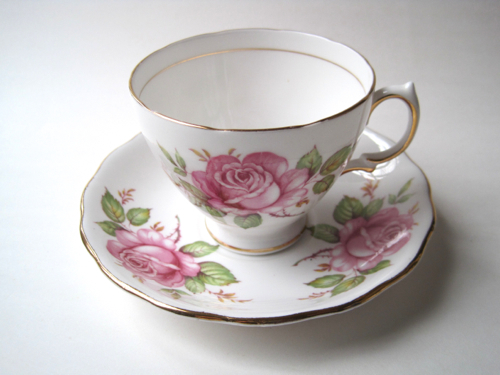 I suppose my eye will always go to roses first, and this teacup is one I know I will enjoy using again and again! Isn't the gilding on this piece just beautiful? 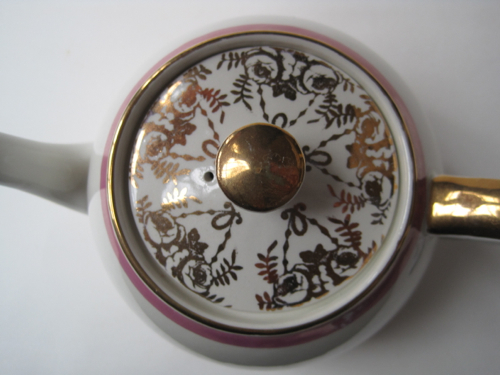 And of course I was all too happy to realize I had a new Wood & Sons teapot on (and in) my hands. Still can't believe my good fortune in receiving all of these delightful teawares but am incredibly grateful to have such generous friends! 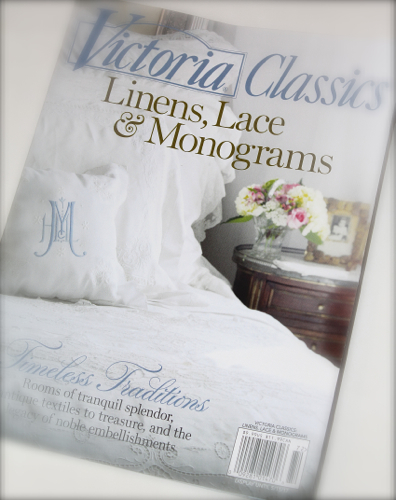 The loveliest new magazine I've seen in ages has landed on the newsstand, a Victoria Classics issue titled "Linens, Lace & Monograms." As soon as I spotted it, I knew I had to have this one. 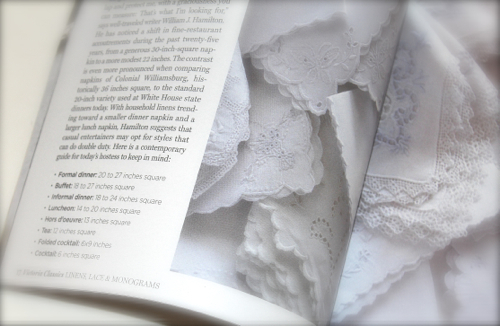 I especially found useful page 17, which tells us the purpose of various sizes of napkins. Tea napkins, according to the article, are 12 inches square. 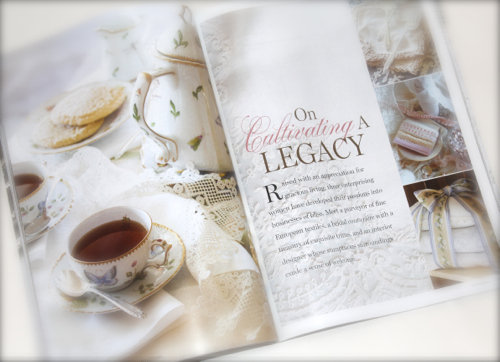 I was not at all surprised to spot a few teawares in these pages, but even if I hadn't seen a single teacup, I found it so utterly soothing to simply gaze upon pretty, filmy, lacy, feminine things for a while. I also enjoyed the stories about three enterprising women who followed their passion and made a business out of their love for vintage textiles. I suspect many of you would enjoy this issue as well, so if you spot it while you're out and about, you might want to take a peek inside! Marilyn Miller! And since I know how to contact Marilyn, I've already got an email headed her way. Thanks to all of you for playing along on Valentine's Week this year, and I hope you have a very Happy Valentine's Month! 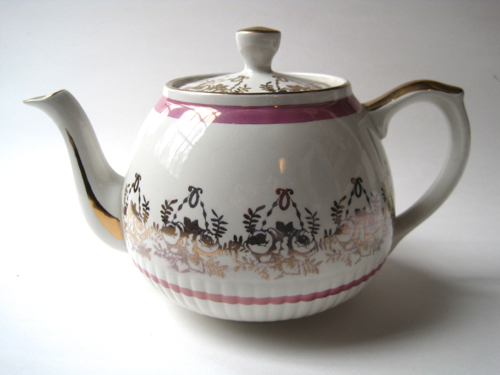 Would you not love to come across a teapot like this one someday? I hit the cyber brakes the moment I scrolled up to the eagle perched atop this silver teapot, which the Metropolitan Museum of Art says is attributed to silversmith Christian Wiltberger of Philadelphia. 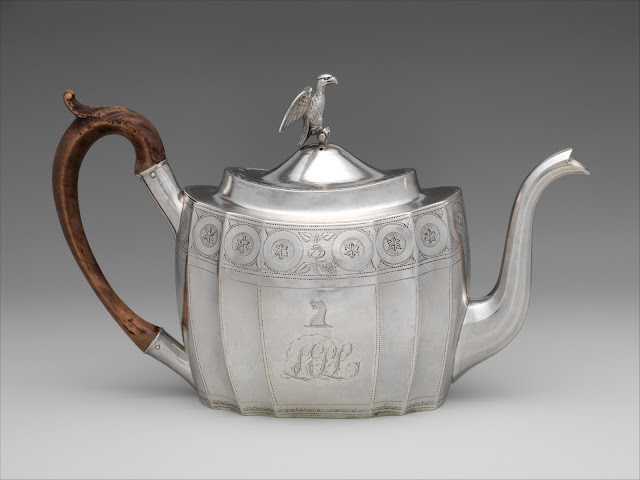 In addition to its images of teapots and other teawares, there are also images of famous tea-related art, including some well-known Mary Cassatt paintings (I have always loved her work), and some photos as well. There are so many great uses for these images, and not just blog posts! 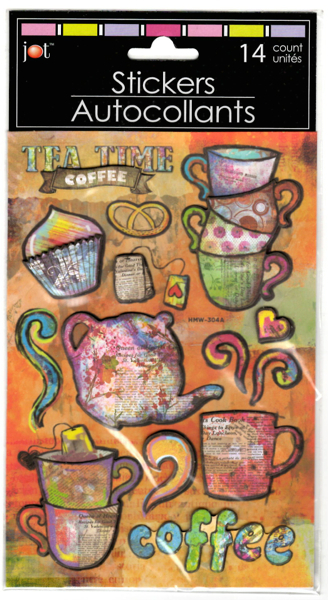 They can be used in presentations about tea, and I love the thought of using tea-themed artwork to create invitations to teatime. If you'd like to check out these images for yourself, I'll share with you the link that Lynn so kindly shared with me: This one. Enjoy! Misty! And Misty, I've just sent you an email asking for your mailing info so I can get these headed your way. Congrats! 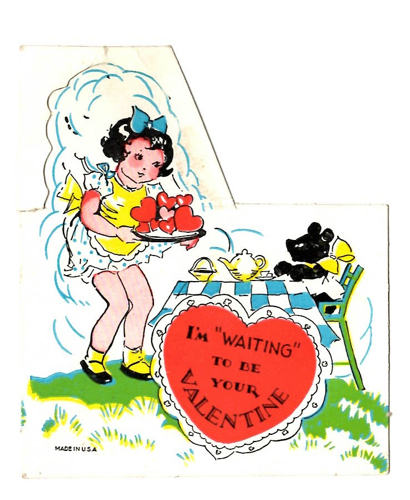 This valentine is large ( about 8 x 13 inches) and is actually a three-dimensional card that folds into place and stands, but I don't think you notice all the detail unless you see the scan. I love the saying on this one: "I pray that your Heart's Garden / May be set with Sweetest Flowers / That your life be like the Dial / Telling none but sunny Hours." Yes! 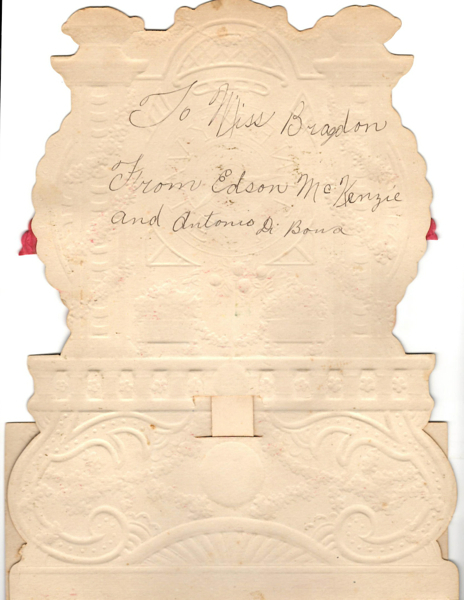 This card was given to Miss Bragdon from Edson McKenzie and Antonio Di Bona. I had to do a search for the name "Antonio Di Bona" because it sounded so exotic, and I found this on Ancestry.com. Some of you genealogists, could this be the right Antonio? 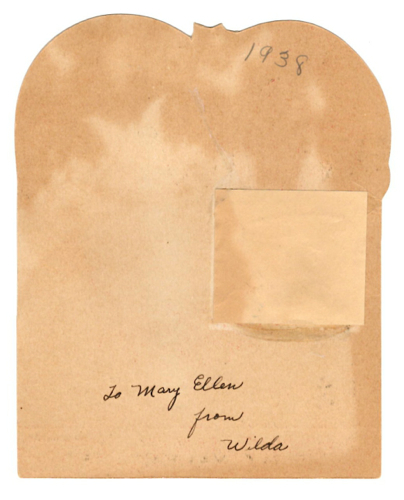 If this is the Antonio who sent this valentine and he was 39 in 1940, that would mean this card was probably sent in the early 1900s, right? It's fun to imagine the past lives of my valentines. 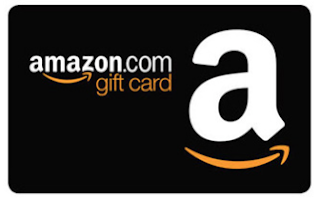 I couldn't decide whether to look for more stationery or another book, so for the final Valentine's Week giveaway, I decided on a $10 Amazon e-gift card that you can spend on whatever you like! Please note: You MUST provide a way for met to get in touch with you if you're the winner. Just leave an "Enter me" to this post between now and 7 a.m. EST tomorrow, Feb. 15, and you'll be entered to win. Good luck, and I wish a very happy Valentine's Day to you all! Beth R.! And Beth, if you'll send me your snail mail address via the email button at right, I'll get this headed your way. Congrats! 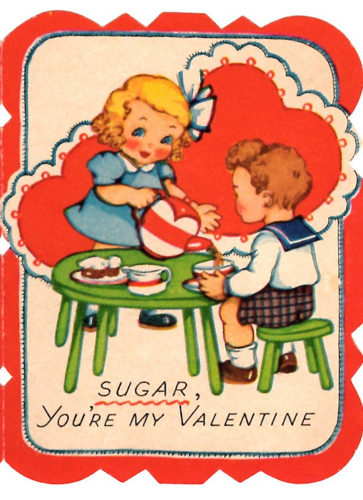 This sweet valentine, dated 1938, is probably one of the older ones in my collection, and I've never seen another like it. 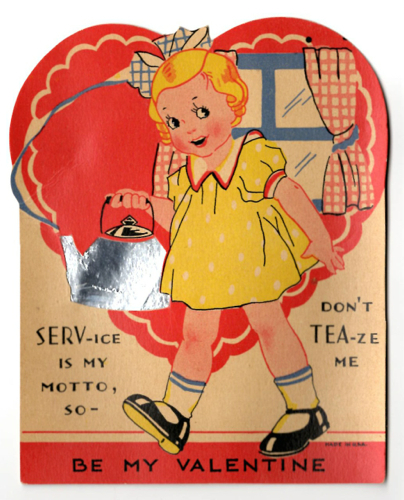 "Serv-ice is my motto, so don't tea-ze me, be my valentine," says the little girl. 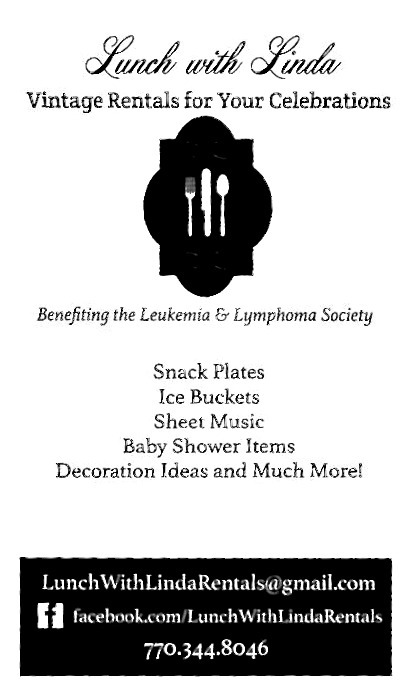 Note the silver foil on the teakettle. You'd think that was just glued on the front of the valentine, wouldn't you? And for today's giveaway, I found another package of these stickers that were such a hit once before. These are from Mary Engelbreit, whose cheerful designs never seem to go out of style. If you'd like to win them, just leave an "Enter me" to this post between now and 7 a.m. EST tomorrow, February 14, and you'll be entered to win. (US and Canada only, please.) Good luck! Lynn K.! And Lynn, I've just sent you an email to be sure I still have the correct mailing address for you. Congrats! This adorable little valentine is one I'm especially pleased to share this year. You see, it was actually a gift from Heidi T. several years ago, but I accidentally filed it away with some non-Valentine's Day cards and didn't rediscover it until last year after Valentine's Day. I saw a listing for one just like this on Etsy (the only other valentine like this that I've ever seen), and I thought, "Wait a minute! I have that one!" And so I delved through every bit of paper in my office until I found it—and it was like receiving the gift all over again! I love that the sweet waitress is serving up a tray full of hearts at this teddy bear tea. The card is signed "Your cousin, Marian H." I don't guess I've ever received a valentine from a cousin, but then I've never sent one to a cousin, either, so there's that. But I do have a "Marian H." in my family, one of my aunts, so I thought that was interesting. 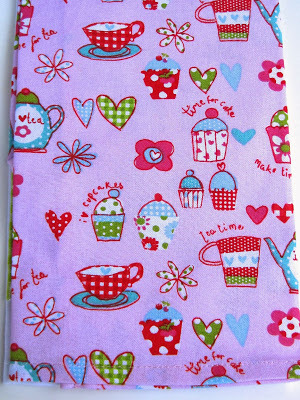 Just as they were featured on today's valentine, teawares and hearts are also featured on today's giveaway, a pink tea towel that struck me as perfect for a Valentine's Week gift! If you'd like to win it, just leave an "Enter me" to this post between now and 7 a.m. EST tomorrow, February 13, and you'll be entered to win. (US and Canada only, please.) Good luck! Barbara Legener! And Barbara, if you'll send me your snail mail address via the email button at right, I'll get this headed your way. Congrats! 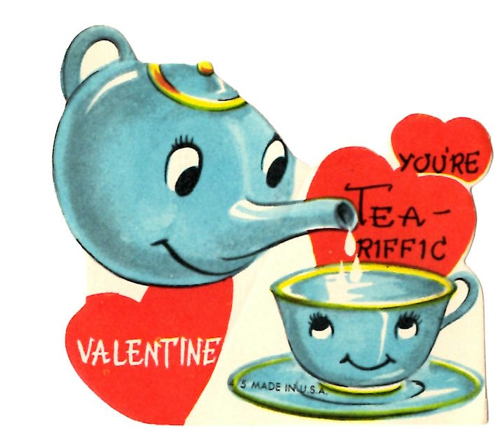 "You're Tea-riffic, Valentine" says this sweet little undated card. There's no design or writing on the back, so I'm left to guess whether this card was ever actually given to someone, and if not, why not. 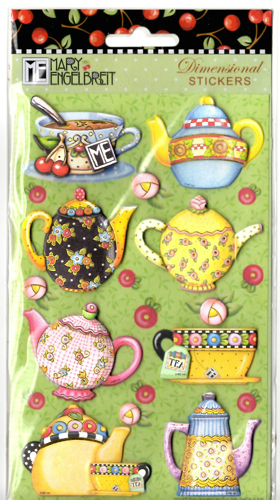 I'm charmed by the eyelashes on the teawares here. A couple of weeks ago, I was out shopping on a Saturday when a neighboring car caught my eye because it had "false eyelashes" that I have since learned are called "carlashes." Click here to see some for yourself. I was tempted to leave a note on the windshield that read, "Please tell me you work in the beauty industry." Who knew? 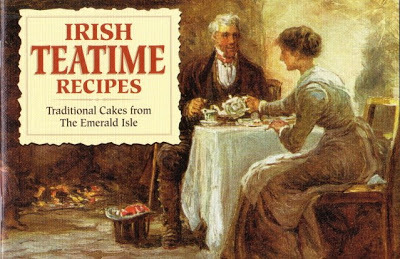 And I decided not to give away any false eyelashes or carlashes, but since St. Patrick's Day is not too far away, today's giveaway is a sweet little "Irish Teatime Recipes" booklet. If you'd like to win it, just leave an "Enter me" to this post between now and 7 a.m. EST tomorrow, February 12, and you'll be entered to win. (US and Canada only, please.) Good luck! Sandy Garvey! So Sandy, if you'll send me your snail mail address via the email button at right, I'll get these headed your way. Congrats! 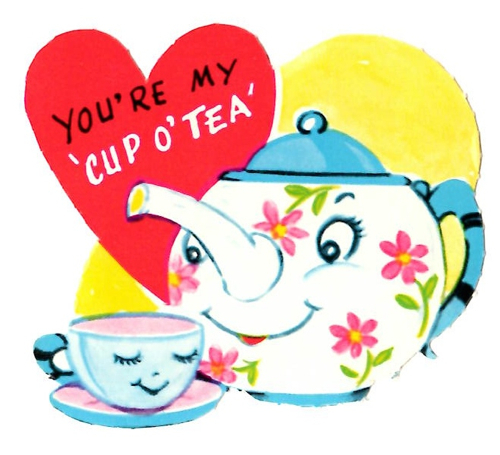 Today's "You're my 'Cup O' Tea" valentine is an undated, perforated one with a smiling teapot and teacup, and they sure make me smile! I like to picture some sweet child helping mom punch out the cards from one of those multi-packs like I saw at the store the other day. 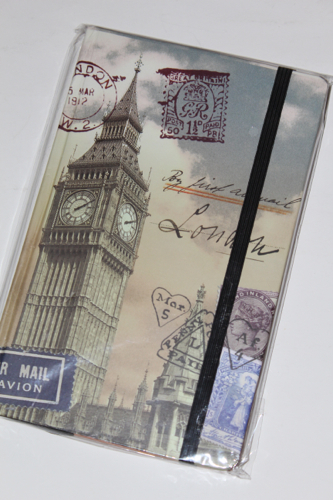 And perhaps nowhere is a good "cup o' tea" more prized than in London, so I thought this London-themed journal would be appropriate for today's giveaway, perfect for anyone who's headed to England soon! If you'd like to win the journal, just leave an "Enter me" to this post between now and 7 a.m. EST tomorrow, February 11, and you'll be entered to win. (US and Canada only, please.) Good luck! Frances! 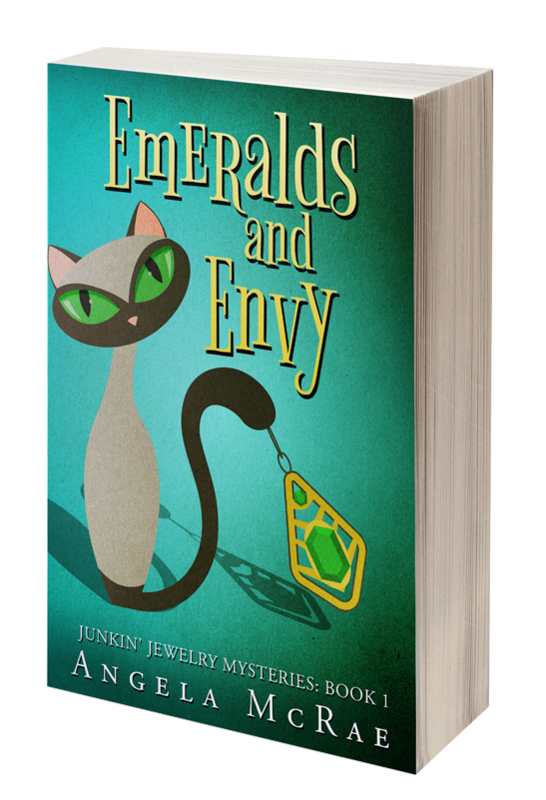 And Frances, since I have your mailing address already, I'll get this book headed your way. Congrats! 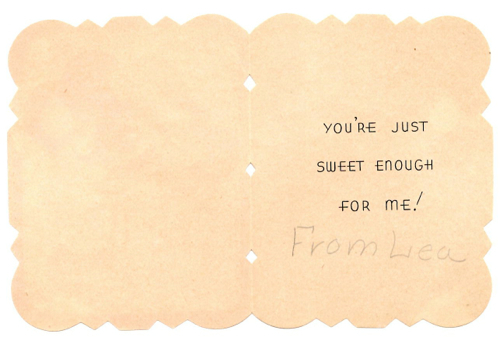 Today's vintage valentine is a thin paper one, which makes me think it is older, perhaps from the 1930s or 1940s. 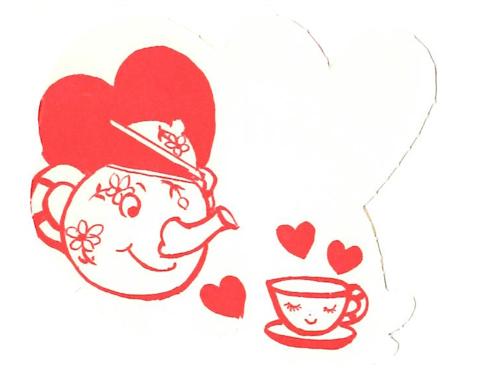 I love the heart design of the little girl's teapot! I don't know who the valentine was sent to, but it was clearly "From Lea." And for today's giveaway, we have a recent Dollar Tree find. Aren't these stickers charming? (I apologize for the inclusion of the word "coffee," but please ignore it and focus on the teapot, teacups and tea bag!) If you'd like to win the stickers, just leave an "Enter me" to this post between now and 7 a.m. EST tomorrow, February 10, and you'll be entered to win. (US and Canada only, please.) Good luck! Yes, yes, I know I said I was going to blog only three days a week this year, but then I realized it was Valentine's Week and thought, oh, dear, I do love hosting that full week of giveaways each year around Valentine's Day. So let's do it again, shall we? 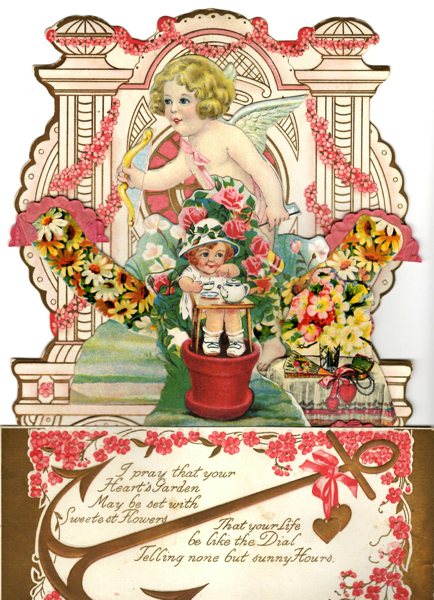 For each of the next seven days, I'll feature a vintage valentine from my collection, and there will be an overnight giveaway as well, so please check back each day to be sure you don't miss out! 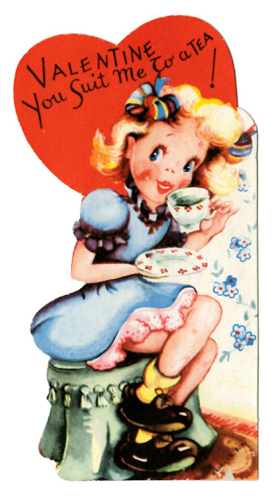 This valentine says, "Valentine You Suit Me To a Tea!" 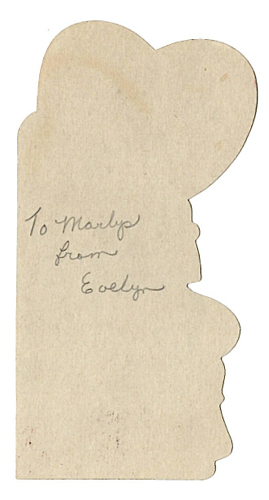 And the back tells me it was sent to Marlys from Evelyn. 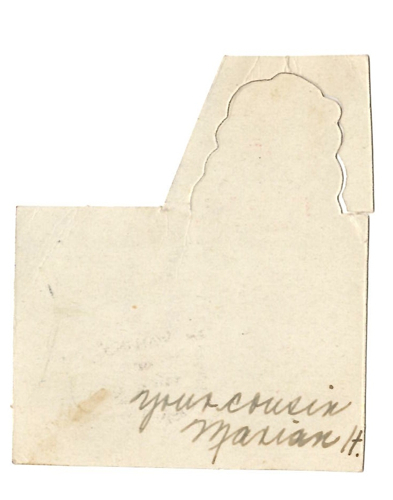 When the valentines are undated like this one, I love to see the names on the back because they help me guess the age of the piece. 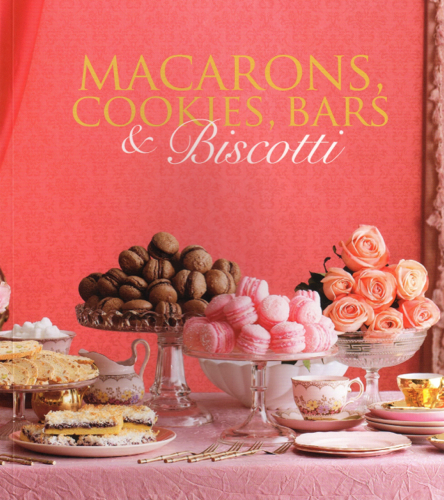 And for today's giveaway, I'm offering a rosy looking cookbook called "Macarons, Cookies, Bars & Biscotti." If you'd like to win this copy, just leave an "Enter me" to this post between now and 7 a.m. EST tomorrow, February 9, and you'll be entered to win. (US and Canada only, please.) Good luck! 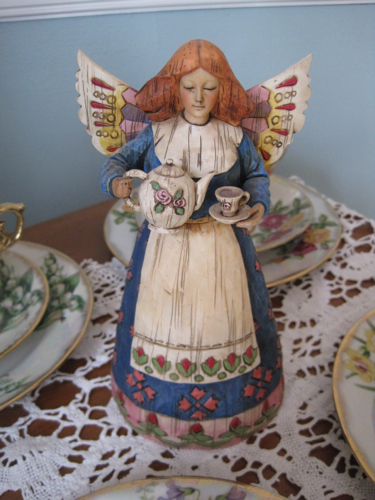 Teacups, trios, and a tea angel ... oh, my! Last week I got a call from a dear friend who will be turning 80 next month. 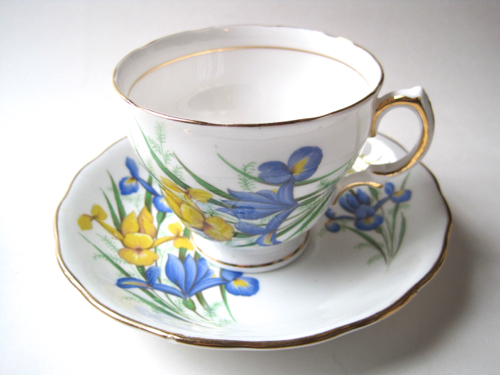 She said she's trying to clear out some things in her house, and she said she had a set of 12 Japanese Flower of the Month teacups that belonged to her late mother-in-law and would be happy for me to have them if I wanted them. 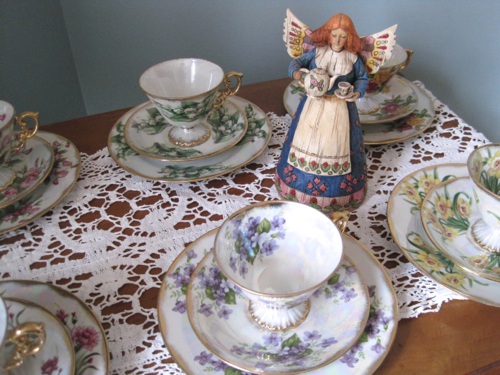 She also had a friend who wanted to give me some English china teacups if I wanted them. Friends, I was there the next day! When I got there, my friend informed me that the Flower of the Month pieces weren't just teacups and saucers but were actually trios! I did not know that these Japanese Flower of the Month pieces had been made as trios, did you? At any rate, I was thrilled to have these teawares with all their beautiful flowers. 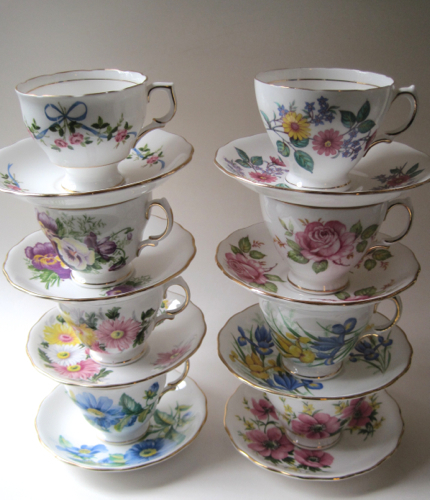 They won't all fit on the tea trolley, so for now I am displaying six of them at a time. They are in absolutely pristine condition. And when I got home, I discovered that also tucked into the giant box of trios was this charming Jim Shore "Angel of Hospitality." I'm still pinching myself that I was blessed with all these new treasures. 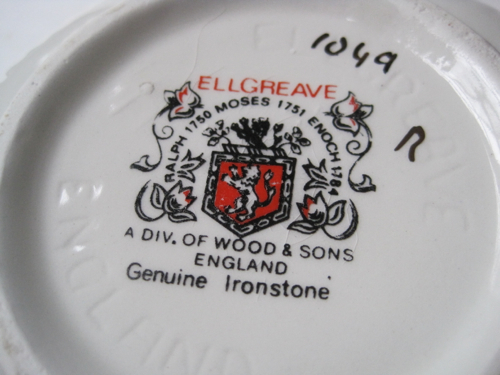 Later this week, I'll show you more of the goodies from the very memorable day that I went home with 20 new teacups! The Coweta Shopper that I write for has a new owner, a former colleague who was quite open to my idea of turning my "tea column" into a "cooking column" (I liked the idea of having a broader variety of topics to write about!) So I probably won't be posting it here each month unless the recipe happens to be something I think tea lovers would be interested in. Here, I shared recipes for two heart-shaped treats I think some of you might enjoy. Although I've written about shortbread on this blog plenty of times, I've never made these heart-shaped treats before, and I think they'd be perfect for Valentine's teas. If you're not a local resident but would like to read this month's column, you can find it online here. Last week, my friend Lynn wrote to let me know of yet another online resource I might want to check out, the Getty Museum Collection website. I had not heard of this site, but following her recommendation, I followed this link and searched for the term "tea." I found lots of fun things to check out, but the image that most astonished me was this one, a tapestry titled, "Le Thé de l'impératrice, from L'Histoire de l'empereur de la Chine Series," which means, "The Tea of the Empress, from The History of the Emperor of China Series." Wow. Just wow. This wool and silk French tapestry is circa 1697-1705, and the piece measures 165 x 75 inches. I cannot even imagine the work that went into this piece … but oh, how beautiful! I don't believe I've ever seen a tapestry depicting teatime before. Have you?